Norfolk, Virginia – Weather was the story of the day for the James Madison Dukes in their matchup against Norfolk State Spartans. The start of the game was delayed an hour and a half due to a lightning delay. After kickoff, the teams got to play one full quarter before the lightning hit the area again, causing the cancellation of the rest of the game. 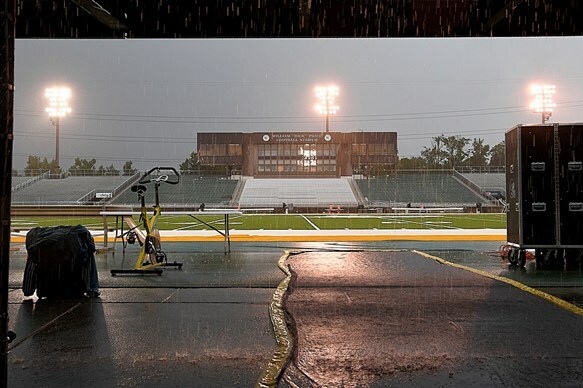 The two head coaches and Athletic Directors conferred and determined that the remainder of the game should be cancelled rather than held over and completed Sunday. With that, the Dukes were awarded a 17-0 win. In the 15 minutes that were played we had a taunting penalty, an ejection for targeting, a record tying interception, a punt return for a touchdown and another touchdown nullified by penalty. On the first James Madison drive of the team, quarterback Ben DiNucci broke though untouched for a 61 yard touchdown run. But as he approached the end zone, DiNucci looked back and did a little high step. That was enough for the official to throw the flag for taunting, taking the touchdown off the board. After the game Coach Mike Houston was not happy with DiNucci’s actions and said if it happened again, he would be standing on the sideline watching someone else play. Two plays later, DiNucci broke through the left side of the line and slid for a 7 yard gain. At the end of the play, Norfolk State senior defensing back Aaron Chandler led with the helmet and hit DiNucci. Chandler was assessed a targeting penalty and ejected from the game. Three plays later, DiNucci took the ball in for a touchdown and a 7-0 James Madison lead. Two plays into the next Spartan possession, D’Andre Thomas tried to go deep, but the ball was intercepted by Jimmy Moreland. It was Moreland’s 14th career interception, tying him for the all time JMU lead with 2017 graduate Raven Green. The Dukes drive would fizzle and they would be forced to punt. After another uneventful Norfolk State drive, they were forced to punt. DeAngelo Amos fielded the ball for the Dukes near the left sideline at the 24 yard line. Amos took off to the other side of the field and was able to turn the corner. With lead blocks from Robert Carter and Jimmy Moreland, Amos scored a 76 yard touchdown. After another Norfolk State punt, the Dukes appeared to put their third touchdown on the board. Marcus Marshall took the ball 16 yards into the end zone, but Riley Stapleton was called for holding giving the Dukes first and goal from the 10. The Dukes were unable to punch the ball in and settled for a 28 yard field goal from Ethan Ratke. From there, the lightning took over and the game was called. While James Madison wound up with the win and came out of the game healthy, Coach Mike Houston was hoping to play a full game to get as many reps as possible for his young team. Houston would rather his team get more live game reps that cannot be simulated in practice. The defense and special teams looked sharp and the speed on both units is noticeable. However, the offense was not as crisp as Houston would like. DiNucci finished the quarter only 1-6 for 12 yards. There were a couple overthrows and a couple of drops. Houston and offensive coordinator Donnie Fitzpatrick will want the offense to tighten up its execution moving forward in the season. The defense and special teams looked sharp and the speed on both units is noticeable. With Hurricane Florence bearing down on the east coast, the Dukes may have a weather impact this Saturday as well. The Dukes are scheduled to play their home opener against Robert Morris in its last tune up before getting in to CAA action the week after against William and Mary.